Exchange OST Recovery - Exchange OST Recovery Tool is very handy for users who wish to recover OST files and save into PST format quickly. This tool has very user-friendly graphical interface and is equipped with lot of useful features. We are offering well and organized solution OST Recovery Software that easily repair corrupted, damaged OST file and recover OST to PST Outlook file with all emails properties and attachments. Advance Outlook OST to PST Recovery Software smoothly convert selective OST folders and maintains formatting and structures into new created PST, EML, MSG, HTML, MHTML and vCard. OST Recovery tool also allow to recover OST Contacts to vCard VCF file. 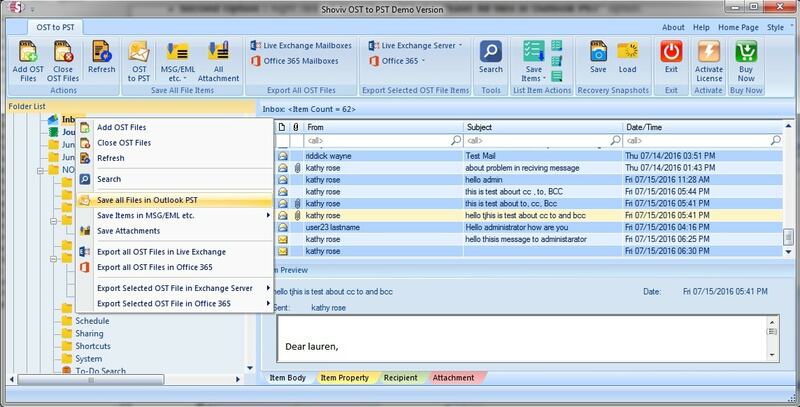 Download Microsoft OST Recovery Software that repair damaged or corrupted outlook OST file & recover OST file included emails properties- to, bcc, cc, time, subjects & from, contacts, calendars, task, notes, inbox items, outbox items, journals & appointments. Microsoft Outlook OST File Recovery Software recover all data f OST file and restore OST file to PST, EML, MSG, HTML and etc. It works on all OST file versions upto 2016 (32 and 64 Bit). Make use of the superb OST Recovery Tool which mechanically quest OST location in your computer hard drive and scans all OST items such as- contacts, calendars, task, notes, journals, inbox items, outbox items and appointments etc. Software performs to convert multiple mailboxes from OST File to several formats and you can download demo version of the software that permits to restore 20 emails per folders.